Once again a licensed private facility, inspected and regulated by federal and state agencies, has proven how cruel and inhumane private ownership of wild animals can be. And, once again, the tragedy in Ohio is just the tip of the iceberg. PAWS was founded in 1984 to address the need for better laws and standards of care for captive wildlife. Our sanctuary is full of animals who were allowed to be kept in substandard conditions, neglected and suffering, until some catastrophe occurred and they were confiscated. Our files are also full of case studies of incidents like the one in Ohio and its tragic ending. More importantly, we are presently attempting to obtain the release of animals and the closure of several other private exotic animal facilities throughout the country. These facilities will continue to operate until private ownership of exotic species is prohibited and captive breeding is kept to a minimum. Too many well-intentioned, uninformed and uneducated individuals collect exotic animals and use them as a source of entertainment for the public, and income for themselves, without considering the responsibility to the animals and the public. When they are confronted with reality, they often respond irrationally and the animals always pay. Often, innocent spectators are injured or killed. In Ohio, the public was protected, the animals were not. Tigers, grizzly bears, lions, leopards and the plethora of species that are kept in roadside zoos, backyards and traveling shows are a precious benefit to life on this planet. It is not our right to own them. We held our first Elephant Grape Stomp in 2004 to celebrate the arrival of 71, Mara, Minnie, Rebecca and Annie at ARK 2000. The five original elephants were moved to ARK 2000 shortly after our first barn, the current African barn, was constructed. We learned about the fondness all elephants display for “everything grape” when 71 was a sickly little baby with no appetite for food. I was voraciously reading any book I could find on wild elephants, and remembered a particularly amusing and informative one, Congo Kitabu by Jean Pierre Hallet, which I had read in the ’70s. At that time, I appeared on a few talk shows with the author and loved his hilarious story about a group of elephants in Africa who found a tree with an abundance of overripe, fermented fruit. The entire herd remained to partake of the bounty. That harvest celebration soon developed into a riotous party of drunken elephants throwing fruit as they slid around the ground, trumpeting and squealing, smashing through the orchard, delighted with the chaos they were creating. The description in the book sounded like a Bacchanalian revel. The anecdote prompted me to try a variety of fruits which 71 occasionally ate in small quantities, but grapes were always devoured instantly. When local vineyards pruned their vines and donated them to the animals, they became a special favorite of the dilettante baby elephant. We planted the first grapevines at the Galt sanctuary that year, and they are still fruitful. We brought a truckload of those vines from Galt to ARK 2000 for this year’s festivities held last Saturday (Oct. 15), and the elephants chomped happily on the addition to the feast of grapes donated by Costco for the event. After the first five elephants arrived at the new property in 2003, many of our neighbors brought fruit to the elephants; the vineyards drove truckloads of grape vine clippings, and the girls ate them like candy. We also learned of the local Calaveras County Grape Stomp which occurs earlier in October, just after harvest. 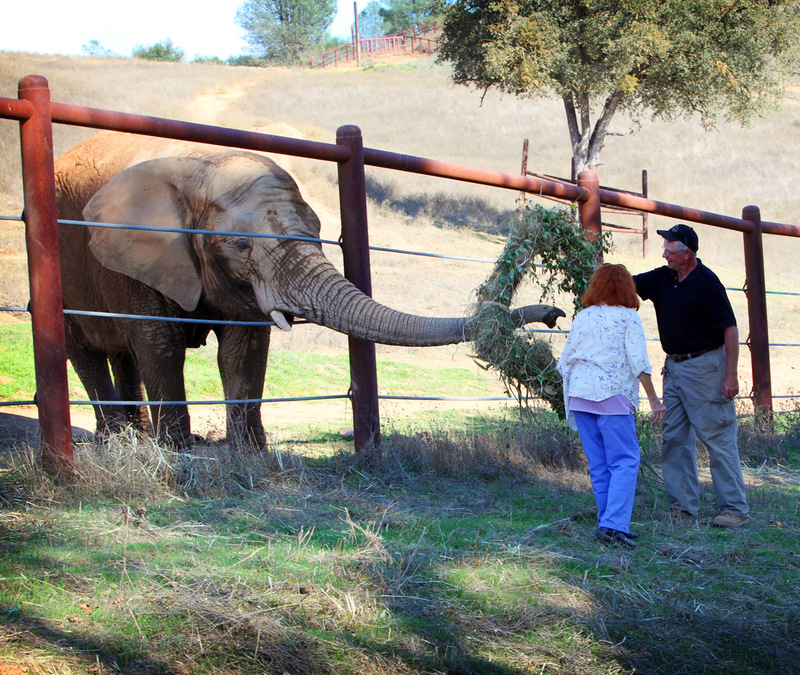 Our first Elephant Grape Stomp was celebrated in 2004 providing our donors an opportunity to visit the new facility. PAWS enthusiastic supporters have loyally attended the popular event which has grown in size for the past seven years. Il Fornaio has donated gourmet food to PAWS events since 1995 — Jeff Newland, one of the owners, always brings an entourage of chefs and servers who prepare and serve food to guests, also feeding volunteers and keepers who often miss lunch during the event. A crowd of over 450 visitors attended the Grape Stomp this year, enjoying some very special entertainment from the six bears, five lions, 26 tigers and nine elephants who cavorted, stalked, roared, chomped and stomped the variety of grapes, vines, pumpkins and other treats and toys that were scattered about their habitats. Local wineries have donated wine and servers each year and guests always enjoy the profusion of wines from the California Gold Country’s award-winning vineyards. Jack, the last bear transported from Galt, was incredibly blasé about the event, noisily gorging on grapes and acorns, ignoring the crowd and the excitement. Sabu and Prince, the two new bull elephants, were quite curious about the visitors, enjoying the plethora of new faces and activity. Sabu, who is very quiet and reserved, delighted all of us when he played with new toys hung from the fence that morning by Margaret and Brian. It was a milestone moment. Prince nonchalantly posed on the hill pushing a fallen tree around as the visitors oohed and ahhed. Nicholas, the veteran of Grape Stomp festivities, casually watched the crowds, accepting their admiration with gracious aplomb. Mara, Maggie and Lulu trumpeted their greetings as the vans unloaded the guests at the African habitat; Mara, our elephant version of Miss Piggy, rumbled requests for more treats every few minutes and Maggie roared and trumpeted her demands for attention, batting her long eyelashes at the enrapt crowd. Lulu, the quintessential lady, stood demurely at a distance waiting for me or her keeper, Michelle, to bring the delicacies to her. Lulu does not compete. Gypsy huffed and puffed back and forth from the treat area to BFF Wanda who refused to walk the distance for a few tasty morsels. When Gypsy roamed too far, she rumbled her “return immediately” call which galvanized Gypsy to action. After the few moment’s separation, when the two were reunited, they squeaked, chirped, roared and rumbled in a noisy display of affection which enchanted the audience. Wanda, like Maggie, simply calls her friends when she misses the attention, then stands, almost smirking, when Gypsy drops everything and races to find her. 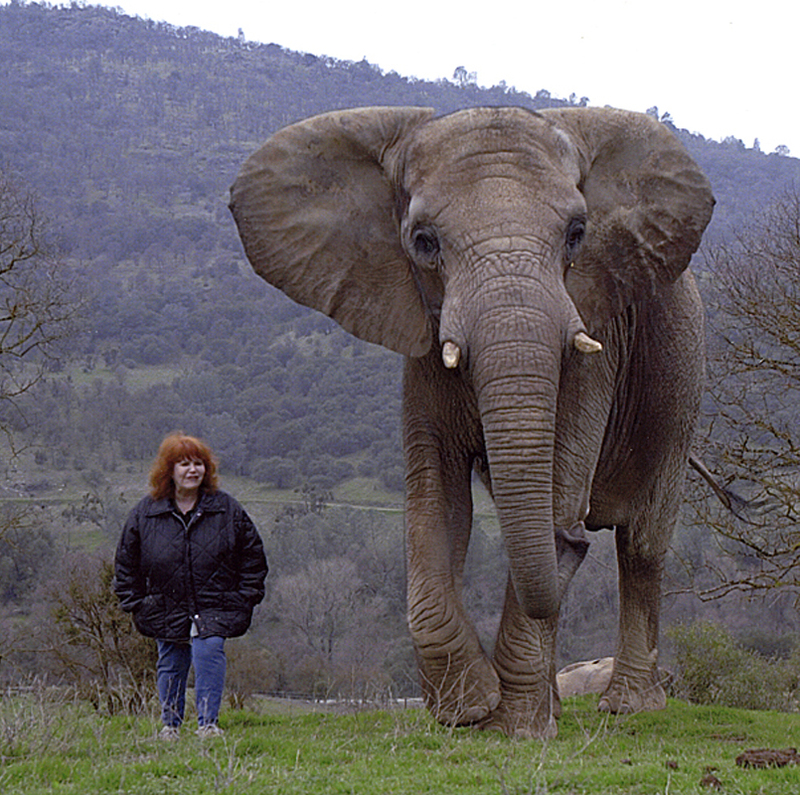 African elephant Maggie, formerly of Anchorage, Alaska, was voted Ms. TUSKany 2011. This is the second win for Maggie, who also won in 2009. The announcement was made during the "Elephant Grape Stomp, An Afternoon In TUSKany" festivities on October 15 at the PAWS ARK 2000 captive wildlife sanctuary in San Andreas, CA. PAWS co-founders, and directors, Pat Derby and Ed Stewart, presented Maggie with an elephant's version of a crown, entirely edible. Congratulations Maggie! Last year, Wanda and Maggie’s fans, from Detroit and Alaska, battled to win the title of Ms. Tuskany for their candidates, and Wanda won. Detroit was elated. This year, Maggie benefitted from the presence of Maggie Ferrari Rowland, one of her adoptive parents, who shamelessly spiked the ballot and Maggie won, with dear little Lulu showing a close second. Click here to view a slide show of Maggie’s win. All the elephants were winners, happily eating the beautiful wreaths made of edible fruits and plants, lovingly designed by PAWS volunteers. Grapes and vines were chomped and yes, Lucy and Ethel, ELEPHANTS DO STOMP GRAPES! Pat Derby is president and co-founder of the Performing Animal Welfare Society (PAWS). The PAWS Elephant Grape Stomp is held each year on the third Saturday in October. Thank you to the following: PAWS staff and volunteers; Jeff Newland/Il Fornaio; Maggie Ferrari Rowland/Jelly Belly/Maggie Ferrari Jewelry Design; The Dessert Cart; Miss Calaveras 2011 and her court; Costco; Devra Lewis and her Blue Mountain Shuttle team; all the wineries — Black Sheep Wines, Bodega del Sur, Brice Station Wines, Catano Wines, Chatom Vineyard, Chateau Routon, Coppermine Winery, Hovey Wines, Irish Vineyards, Ironstone Vineyards, Metate Hill Vineyards, Milliare Wines, Renner Vineyards, Stevenot Winery, Tanner Wines, Twisted Oak Winery, Vina Moda Winery, Zucca Mountain Vineyards; and everyone who donated to our silent auction! I am often asked when the vision of PAWS first emerged as a reality, and how we decided to start a sanctuary for captive wildlife. I wish there were a quick and romantic response, but that is not the case. Ed and I never really planned to operate a non-profit organization, and certainly not a sanctuary. 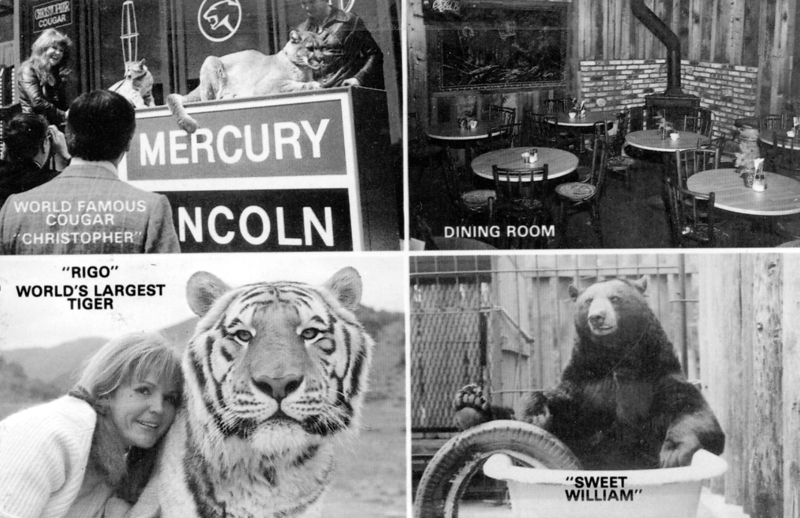 And, by the way, “sanctuary” was my descriptive designation of our attempt to properly house and provide care for the hundreds of exotic animals who were in need of refuge in the early 1980s. At that time, animal shelters were often as bad as roadside zoos, with handlers walking young lions and tigers on leashes and breeding animals to provide more homeless cubs for display and photo ops. I chose “sanctuary” to exemplify our mission which we hoped was different. But I digress, and this is a long explanation, so stay with me. Time did not fly, it slowly crawled across years of depressing experiences observing sick, dying, malnourished and helpless young and old animals who were part of the exotic animal industry. My enlightening experiences with captive wildlife resulted in the publication of my first book, The Lady & Her Tiger, in 1976. It was a Book of the Month Club selection and won several awards; it was also the first exposé of the use of exotic animals in films. I didn’t know it at the time, but I was an animal activist before the term was conceived. I had stumbled upon the exotic animal world while working as an actress, dancer and singer. Working on a television show with animals literally changed the course of my life and I found myself desperately trying to make life better for an eclectic array of exotic animal species working in the animal shows and movies which were popular in the late ’60s and early ’70s. I kept a journal of my harrowing experiences which became The Lady & Her Tiger. And then I met Ed Stewart, my partner in life and work, a soul mate, although neither of us knew it at the time. It was not love at first sight. 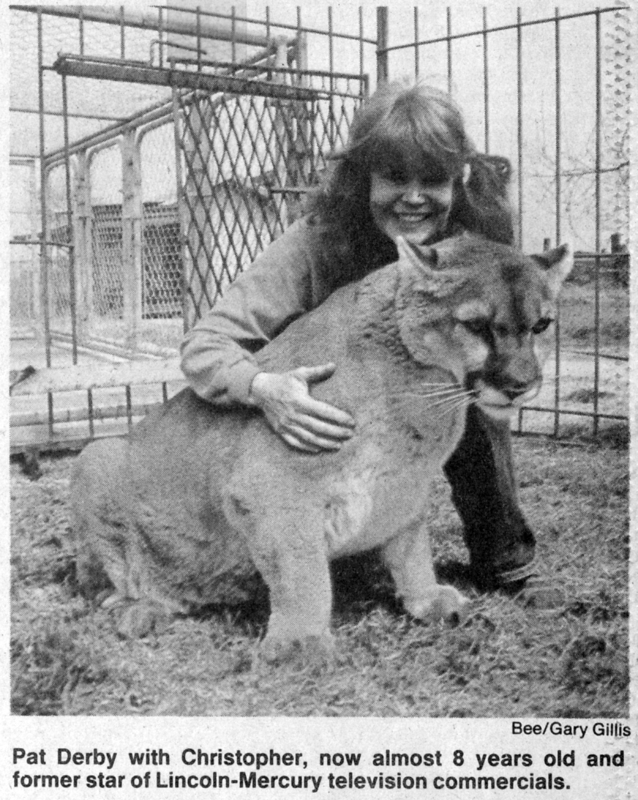 I was the trainer for Lincoln Mercury’s “Sign of the Cat” car commercials and mother/protector of the popular cougars, Chauncey and Christopher, the animal stars of the television advertisements. Known among the advertising executives, and Lincoln Mercury’s directors, as a temperamental virago who demanded impossible luxuries for the feline performers, I was often the precursor to headaches and heartburn. Ed often says he will never forgive his brother, and he has been taking care of me since that memorable day in 1976. He followed me to Detroit for a car show, and then to California. My friends did not expect him to last longer than three months; to my surprise (and his) we have survived 35 years of tenacious determination to educate the world about the injustice of captivity for wildlife. Neither of us would change a minute of the times we have spent blundering through challenges, too stubborn to quit. 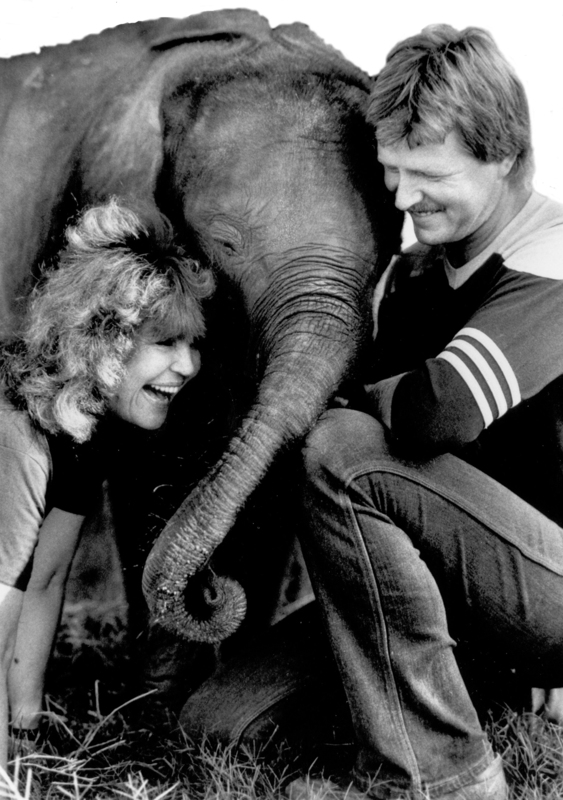 We traveled across the country promoting the book and working in films with the animals I had acquired, and would never relinquish, until the publicity from the book sounded a death knell to my career as an animal trainer. I was persona non grata in Hollywood. We purchased a resort in the redwoods of northern California in 1978, retiring our animals to the peaceful surroundings of the big trees. The animals loved it, and Ed and I, cheerfully at first, launched our new career as proprietors, cooks, dishwashers, bartenders and cabin cleaners at Howling Wolf Lodge in Mendocino County. This is the postcard Ed and I made in 1978, to promote our new business, Howling Wolf Lodge in Leggett, CA. The recession of that time seems worse to us than that of today — perhaps because we became resort owners at a time when gas prices soared and few could afford a vacation in the redwoods. We worked long hours supporting our small group of precious animals who loved life in the forest. In 1980, an animal trainer who read my book and recognized the villain of the piece, appeared at the lodge and enlisted our advice in exposing more cruelty in the Hollywood film industry. We launched a full scale investigation by the United States Department of Agriculture (USDA), and a four-part television disclosure from our resort, which led to the revocation of the license of the largest supplier of animals to films and television. 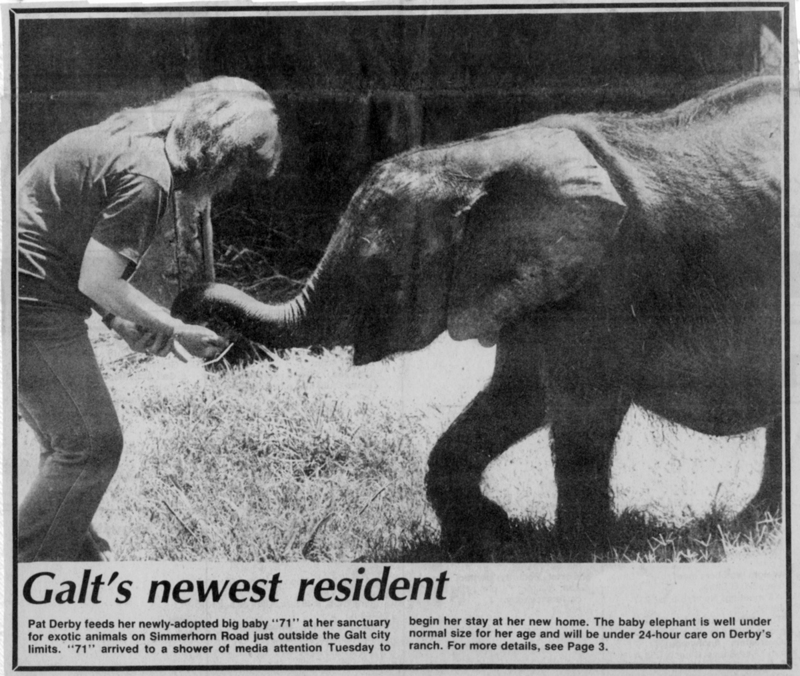 In 1984, we met our hero, then Assemblyman Sam Farr, who agreed to introduce legislation in California that would set standards for the care and handling of captive wildlife. AB 1620, now part of California’s Department of Fish & Game Code, was passed into law in 1985. We moved our group of retired performing animals to Galt, California, in 1984, renting a rural, defunct dairy and dog kennel. We expected to return to the redwoods once the legislation was passed and we had remedied the cruelties involved in the use of captive wildlife in films and television. Naive as we were in those days, we had little understanding of the vast financial empire of the exotic animal world and its ties to drugs, guns and criminal activities. Our bill awakened a hornet’s nest of powerful enemies and political opponents. Meanwhile, our arrival in rural Galt triggered a constant stream of animal control officers bringing confiscated lions, wolves and other exotic animals to our door. We were the only permitted exotic animal facility in the area, and they desperately needed places to keep confiscated animals until they were reclaimed by their owners. This photo appeared in the Sacramento Bee shortly after we moved to Galt, CA. Ed and I had lost our visible means of support and were facing a growing number of mouths to feed beyond Christopher, J.C., Lucifer, Lucretia, Sweet William, Harriet, Stanley, Seymour and Gwendolyn, our own beloved, and dependent, brood. We decided to seek employment with one of the national animal welfare groups who had offices in the area, and began making rounds feeling confident that one of them would surely want to delve into the cruelties involved in the use of animals in entertainment. Several groups invited us to speak, and everyone was interested, but none wanted to spend time on the issue. They advised us to form our own group, the unwelcome suggestion that we had avoided assiduously in the past. Elsa, a four-month-old lion cub, had just arrived, brought by animal control officers to spend a weekend with us until her loving owners reclaimed her the following Monday. The adorable lioness lived with us until her death at age 15. Her doting owners did not return to court and never contacted us to see how she was faring. Welcome to the world of exotic pets, Pat & Ed. The Performing Animal Welfare Society (PAWS) was formed out of necessity, with former loyal patrons of Howling Wolf Lodge assisting with the legal paperwork and becoming our first donors. Most of them are still with us, and we are eternally grateful. With hiccups and lurches we staggered through those first years convinced that, once we had educated the public and all concerned, the problem would be solved and there would be no need for refuge for the victims of the captive wildlife trade. The shelter in Galt would serve as a temporary solution. You guessed it. WRONG AGAIN. Stay tuned for more. . .